The Samsung Galaxy Note 8 is launching in August, and it is already known that the phone is going to feature dual rear cameras along with the rear-facing fingerprint scanner. Yes, you read right. There isn’t going to be any screen-embedded fingerprint scanner on the Note 8 as this technology isn’t ready to be used on a smartphone perfectly. Samsung has already said that the In-screen fingerprint scanner causes some technical issues, so they aren’t implementing it on the Note 8. 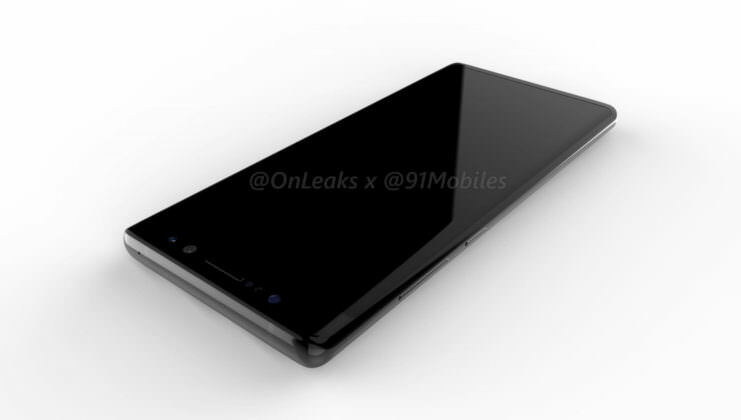 Anyways, today we have got our very first look at the renders of the Note 8 (based on Factory CAD) shared by Steve Hemmerstoffer aka OnLeaks on Twitter. These renders have confirmed the information revealed by Evan Blass via VentureBeat that the phone has horizontal dual rear camera setup on the back and the fingerprint scanner is still in the same position. The phone has the same infinity display with lesser bezels as compared to the one on S8 and S8+. On the bottom, there is the USB Type-C port along with the Primary Mic, 3.5mm headphone jack, Speaker, and S-Pen Slot. The volume rockers along with the dedication Bixby button is present on the left with the power button on the right. Now coming to the main highlight of the phone, i.e., the cameras. There is dual camera setup on the back, and the two sensors are placed horizontally. There is a slight change in the placement of LED flash and hear rate sensor as they are now placed right to the two sensor along with the fingerprint scanner, unlike the S8 and S8+ on which, the LED flash was on the left side of sensor and fingerprint scanner was on the right. 6.33-inch Super AMOLED Quad-HD Infinity Display. So, what are your views on the design of the Samsung Galaxy Note 8? Liked it or not? Do let us know via the comment section.